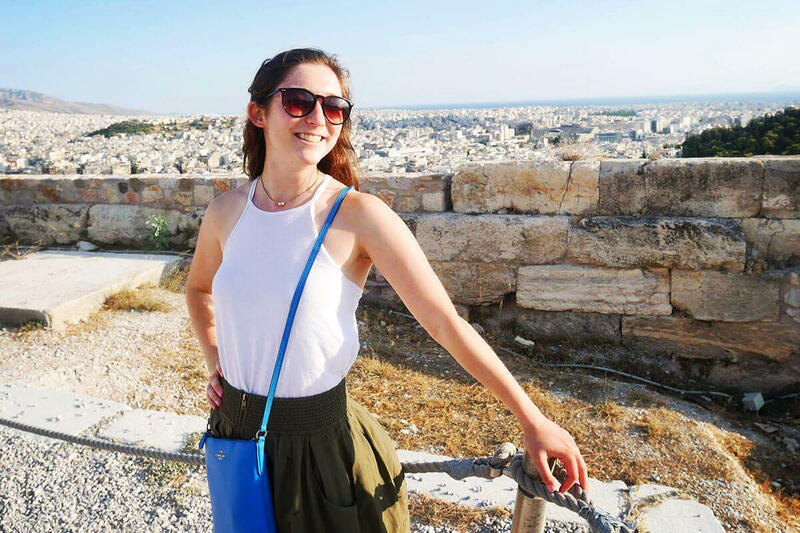 History and political science major Mary Ninneman studied abroad in Athens, Greece, where she furthered her study of human trafficking. 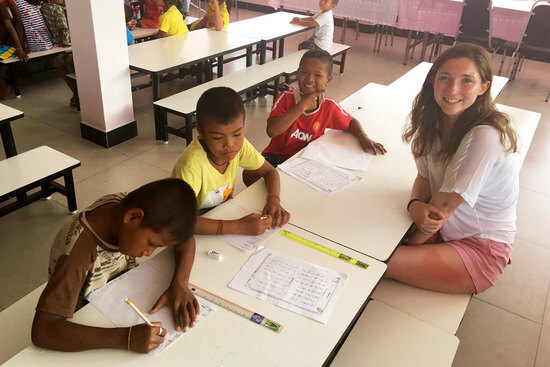 Senior Mary Ninneman has been to Thailand, Greece, and Washington, D.C., studying the causes and effects of human trafficking — and those experiences inspired her to further study the issue in the place she knows best. A history and political science major, Army ROTC cadet, and member of the Glynn Family Honors Program, Ninneman’s four years of academic, internship, and international experiences have culminated in a senior thesis analyzing how the issue she’s most passionate about impacts her home state of Nebraska. The summer after Ninneman’s first year, she participated in a cultural understanding leadership program in Thailand through Army ROTC. For part of the trip, Ninneman and her classmates worked at the military academy there. For the rest, they helped at an orphanage and school, where they encountered many children who had been victims of human trafficking. Ninneman, helping to teach Cambodian refugee children in Thailand. They children are picked up each day to avoid being taken by human traffickers while their parents work. This initial experience led Ninneman to take a course her sophomore year called The Roots of Human Trafficking in Africa with Mariana Candido, an associate professor of history who is now Ninneman’s thesis adviser. After her sophomore year, Ninneman interned in Washington, D.C., for U.S. Sen. Ben Sasse of Nebraska. A fellow history major, Sasse was very willing to help Ninneman plan for her thesis and work on what interested her. Ninneman was allowed to attend a hearing on the Trafficking in Persons Report, released by the State Department each year to assess how well countries are fighting against human trafficking. She was also able to help identify what legislation or efforts could be pursued to combat trafficking. Then, as a junior, Ninneman studied abroad in Athens, Greece, where she took a course on the refugee crisis. Ninneman found connections to human trafficking in their discussions of migratory movements. “I was seeing how, in so many avenues, the most vulnerable are subject to this terrible exploitation of human life,” she said. 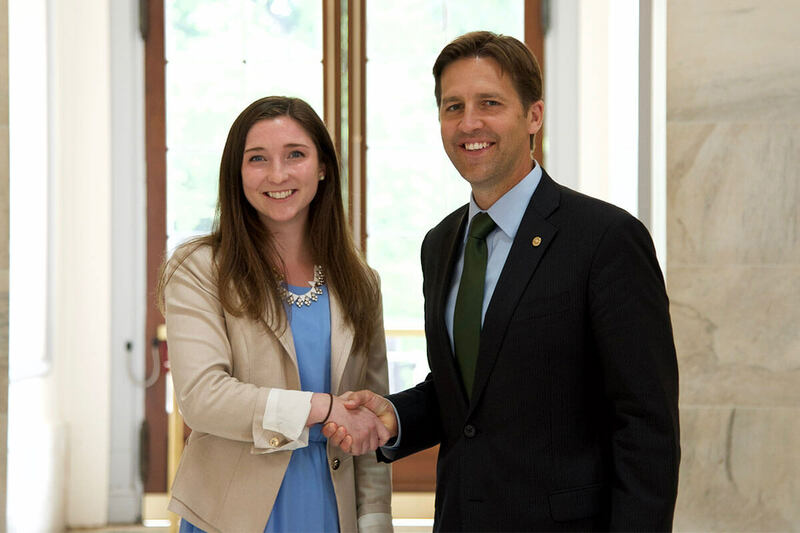 Ninneman with U.S. Sen. Ben Sasse during her internship in Washington, D.C.
Over fall break this year, Ninneman interviewed people involved in the struggle against human trafficking in Nebraska. She received funding for her thesis research from the Glynn Program — another influential experience during her time at Notre Dame. Glynn coursework and faculty truly helped her grow and excel at Notre Dame, she said, challenging her as a thinker and a writer from the beginning of her first year. “The classes pushed me to develop my writing skills, and I think that has helped me in all of my Arts and Letters classes,” Ninneman said. In her majors, Ninneman enjoys exploring a wide variety of topics, including history courses focusing on nearly every region of the world. That coursework has given her a global viewpoint and an ability to contextualize the United States’ actions and their impact on other countries, she said. Both have helped prepare her to be a successful leader in the military. Ninneman is commissioning in May as a second lieutenant military intelligence officer. After her four years of military service, she hopes to continue her efforts to fight human trafficking by working for the State Department or a nonprofit organization. She is also considering a career in human rights law. Her sense of duty has been reinforced in her majors, she said. Originally published by Hailey Oppenlander at al.nd.edu on December 10, 2018.